Due Process & Just Compensation for the "Taking" of Property Rights | RANGEfire! 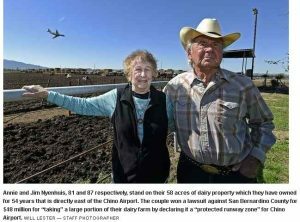 The lawsuit, which went into private arbitration, claimed that the county had, bit by bit over the past 25 years, turned most of the 58 acres of dairy land owned since the 1960s by Jim and Annie Nyenhuis into a runway protection zone. Planes, including private jets, fly low right over the family’s ranch-style home and property on Remington Avenue as they come in for a landing at the airport, just west of the dairy. The designation precluded most of the acreage from development, even as property all around the Nyenhuis’s farm turned into commercial and housing developments, the lawsuit said. The $48 million includes the value of the 58-acres of land, legal costs, and relocation money for Jim and Annie Nyenhuis, said their attorney, John C. Murphy. The award is not final, county spokesman David Wert said Thursday. “I respectfully submit, it’s over,” said Murphy. A stipulation in the case said the parties need to participate in a final order of condemnation. Under terms of the agreement, the final judgment cannot be appealed. Murphy said in an interview that the county agreed to arbitration in the case as evidence mounted that a development plan for the airport was referred to as a “draft” plan only to avoid admission of language that the county should buy the Nyenhuis property. “The suit in question wasn’t filed until 2015. The only reason it took time to settle the case was that the two sides had vastly different opinions on the value of the land,” county spokesman Wert said. The couple — Jim is 87 and Annie is 81 — raised eight children at their home, which faces north and now looks across the street at a commercial building development where other dairy properties once sat. And more development is on the way. “We’ve always been happy, but now we’re getting closed in,” Annie said during an interview a the couple’s home. “Today, you need a bigger dairy to operate, and there is no more land. The couple are both postwar immigrants from Holland who worked their way through the Southern California dairy industry, making their way to Chino and developing their property in the 1960s. A stipulation filed in August of last year followed a February denial of a county motion for summary judgment and the beginning in April of a deposition of San Bernardino County Airport Director James Jenkins. The stipulation said the parties had engaged in settlement discussions, and that the Nyenhuis family agreed that the county could acquire the property for public use. The county agreed to compensate the family for the taking of the property under California’s eminent domain law. The arbitration under retired San Bernardino County Superior Court Judge John W. Kennedy assigned an independent appraiser to value the Nyenhuis land, which came to $47.3 million, Murphy said. In addition, the mediator also said the county should pay $480,780 for legal fees and relocation expenses of up to $200,000. There may be something for the county in the agreement: There are 20 acres on the east side of the property that is outside the no-build zoning and viable for development. The stipulation says the Nyenhuis family will agree to convey some portion of the property , as identified by the county, directly to a third party.